With the MX-2009, Mitashi ventures to create a new breed of compact, convenient and versatile entertainment solutions. Besides playing the customary DVDs, VCDs, MP3s, radio, etc., this new player also plays your favorite files that are stored on a USB device, Multimedia or SD cards. 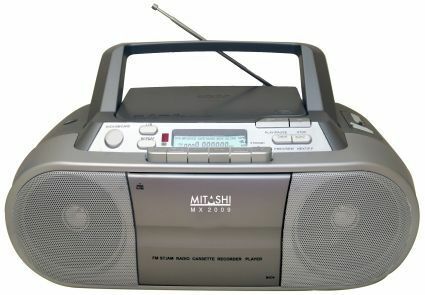 But the most heart-warming feature of all is that the MX-2009 retains the good old audio cassette player and recorder. While most manufacturers have stopped providing the same, Mitashi ensures that all those favorite audio cassettes too precious to throw away are still playable. Play them again without having to convert them into CD's! With the new player, you can also sing along with your beloved artists with the built-in karaoke feature along with dual mike jacks. This lightweight portable multi-player also adds up as a great travel companion as you can carry this boom box when you are planning for an outing to your vacation home or the beach or even if you are going for that long weekend. The MX-2009 Entertainment Box is available now for a price of Rs 4,709.